We're nearly halfway through the month here at SuperPhillip Central without a new review. That changes this evening with a game I've been waiting to go in-depth with for a while now, Splatoon 2. Now that I've seen everything the sequel to the smash Wii U hit has to offer, it's time for my Splatoon 2 review! Despite the company's perceived problem with creating new games that don't feature one of their cornerstone characters, like Mario, Link, Pikachu, or Kirby, Nintendo has pushed out a lot of new franchises in the past decade or so from the Wii on. 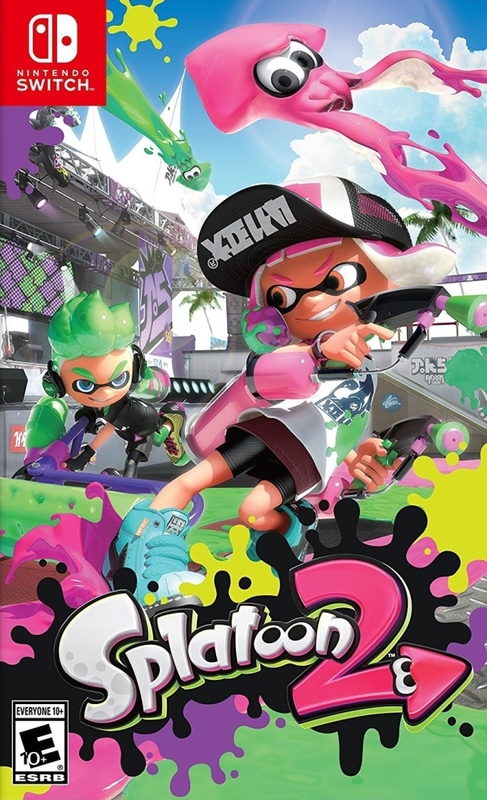 Recently, one of their biggest successes with a brand-new IP is Splatoon, which managed to become a highly successful new series despite being on the failure of a system, the Wii U. This was after a notable number of gamers and the press preemptively called the unique third-person shooter dead in the water. Now, after the Wii U comes a success story for Nintendo, the Switch. Leading up to the release of Nintendo's next big multiplayer-focused game for the system, Splatoon 2, many found themselves concerned that there wasn't enough new in the previews and footage shown for the game to call it a sequel rather than just an expansion. However, as you'll see with this review, there's enough new here to differentiate it from just being a token expansion to the Wii U original. Welcome to the freshest spot in Splatoon 2, Inkopolis. I say this, despite Splatoon 2 pretty much feeling and playing like the original in many ways. Aside from new tactics available to you, Splatoon 2 still contains its focus on splattering the environment with paint rather than other players. KO's are definitely present in the game, but they're not the focus in the Splatoon series unlike in much more traditional third-person shooters. In fact, no mode in Splatoon 2 requires splatting other opponents. Instead, each mode has an objective to it that has nothing to do with the obliteration of other players. 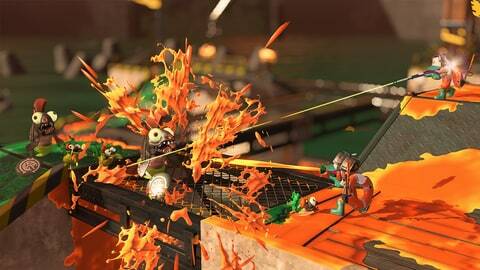 Though, it is helpful to splat foes to get them out of your way and send them back to their spawn point. patches of ground; no so great for long-range skirmishes. Before delving into the major modes, let's talk gameplay. 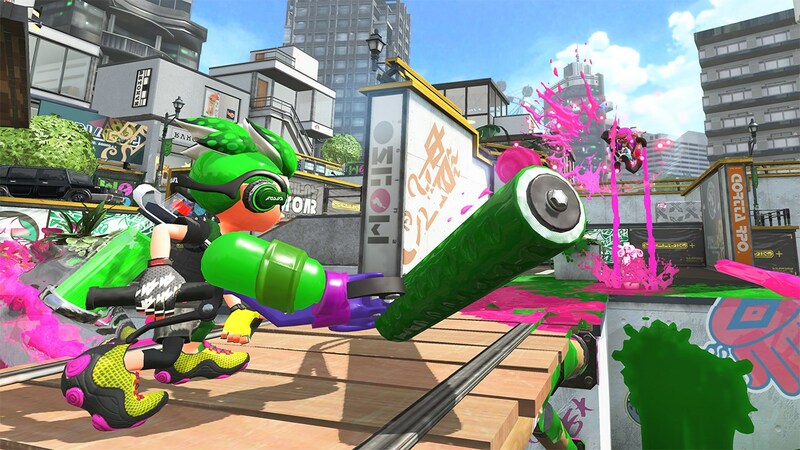 Splatoon 2 is a shooter based on mobility and teamwork (each mode has two teams of four players each battling one another), among other aspects of play. The mobility comes in from just how many options you have available to you to get across each map and arena. This is thanks to your ability to switch between kid and squid mode at any time. Kid mode offers the offensive capabilities, shooting out colorful ink with one of your selected weapons. With over a dozen weapon types which offer differing advantages and disadvantages, rates of fire, attack strengths, ink storage, and secondary and special attacks, it's important to find your footing and choose the weapon that best fits your play style and what you're most comfortable with using -- or you can just switch between weapons at your leisure, just getting a feel for each depending on the mode. Likewise, as a squid, you can drop down between grates, ride through similarly colored ink to gain speed and also replenish the ink in your usable tank, and even climb up walls to higher points by utilizing ink sprayed on them. Of course, as I said, kid and squid modes can be switched between any time and with ease, allowing skirmishes and battles for turf all the more complex and exciting. For instance, just splat down some ink, dive into it in squid form to speed around your foe, pop out of the ink as a kid, and then blow them away! That said, only your team's ink is something you can swim and move through without issues. Otherwise you'll trudge through enemy ink, making you an easy target as you move much more slowly, can't enter squid form, and take small amounts of damage in the process. 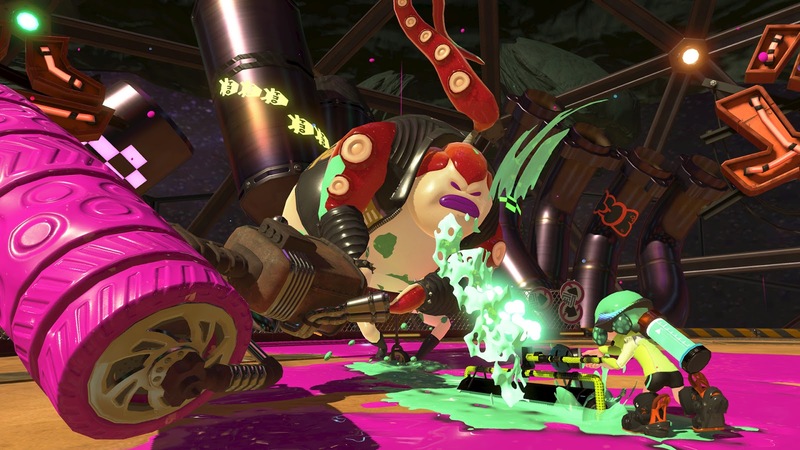 With the game's multiplayer modes, Splatoon 2 contains four of them to enjoy. The most basic and the only one available in multiplayer battles at first is Turf War, the main and most prominent mode of the Splatoon 2 experience. 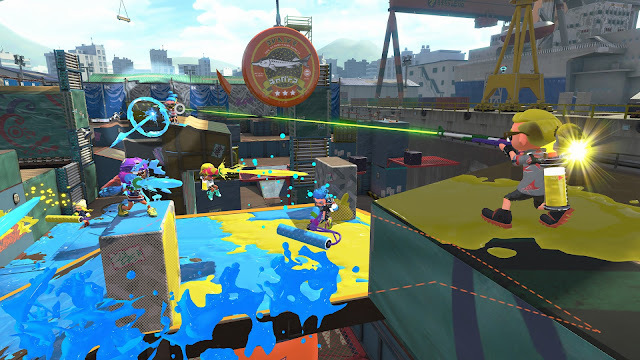 In this mode, each of the two teams try to spread as much of their colored ink across the given map -- though walls don't count, they benefit players by allowing them to climb up them in squid form. At the end of the three minutes of play, the squid squad with the most coverage of the map in their own ink wins. What I like about this mode is that a team rarely is out of the fight, unless each teammate goes off and does their own thing (which is popular to do because "lol teamwork" and "lol being able to use voice chat in random matches thanks to Mother Nintendo"). Comebacks are always possible. Just one death of a teammate at the wrong time can have the other side mount an amazing offensive, taking the most important part of each map, the middle, in the process. if not into your own team's territory. There's no worse feeling in a Turf War than having most of the map under your ink's cover most of the map, only for your teammates to get splatted and sent back to the team's spawn point, giving free reign to the opposition to cover as much map as possible with their ink in the last thirty seconds of the match. 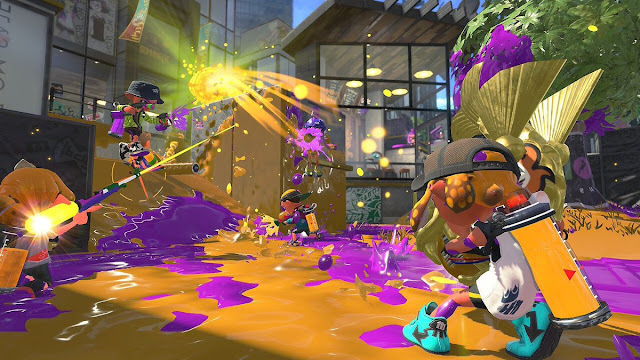 Color up as much of the map with your team's ink to win Turf War. The other three modes are locked behind Splatoon 2's ranking system, which is understandable for newbies but less enticing to Splatoon veterans who just want to play something different aside from Turf War. Everyone begins at level one when they first play multiplayer. As you participate in matches, win, and the like, you earn points that eventually allow you to go up another rank. The good thing about Splatoon 2 is that just finishing a match awards you with experience points as well as money. To have access to the ranked modes in Splatoon 2, you need to reach Rank 10, which takes about 1-3 hours of playtime to do depending on your skill level and persistence. Besides the Random Battle's Turf War, Splatoon 2 features the Ranked Battles' Splat Zones, Tower Control, and Rainmaker. Splat Zones has both teams starting at 100 seconds on maps with a zone to cover in your team's own ink. As you control the splat zone, the timer ticks down towards zero, but you can lose control at a moment's notice. Splat Zones is pretty much king of the hill with a Splatoon 2 twist, but it's also my favorite of the three Ranked Battle Modes included in the game. Tower Control's goal is to ride a tower that sits in the middle of the map to begin with into the enemy team's section of the map. The tower only moves forward while the top is covered in ink, and the opposition wants that tower in YOUR end of the map as well. Thus, a vicious game of tug-of-war tower-style with teams raining down ink on the tower and opponents is all but ensured. Last but not least, Rainmaker has both teams vying for the titular weapon of this mode, a beast of a cannon that can blow away foes with ease. The objective of this mode is to take the Rainmaker and transport it to the enemy base. Though for that player carrying the Rainmaker, they have an octopus-sized target on their backs. All three modes are definite winners, but it would have been nice to see a new mode that wasn't featured in the Wii U game. This player is certainly making it rain with the Rainmaker. Thank goodness that Inkling was present for arm day as that weapon looks heavy! So, there's a lot similar to Splatoon, but what makes Splatoon 2 stand out from its predecessor? One thing is the upfront content available to you from the get-go. Instead of bare-bones, drip-fed content (such as a limited selection of maps, weapons, and modes), a significant amount of stuff is available right from the start. It only gets better each week with new additions to the multiplayer like maps from the original Splatoon (with specific touches to make these maps feel fresher) and all-new maps as well. Splatoon had an original single-player campaign to teach the basics of the game to players, and Splatoon 2's is a lot of fun, too, and does the same thing. Five worlds featuring multiple levels and one boss each, alongside each level featuring some main mechanic or obstacle to get a hold of or come to grips with, hidden collectibles, and challenges. The campaign also includes added replayability by allowing players to come back to previously cleared levels with different weapons, which changes how each level is played completely. Each weapon you complete a level with is documented on the menu screen. If you're really ambitious, you can use your favorite weapon and beat all the Splatoon 2 campaign's levels with it to unlock it in multiplayer mode. 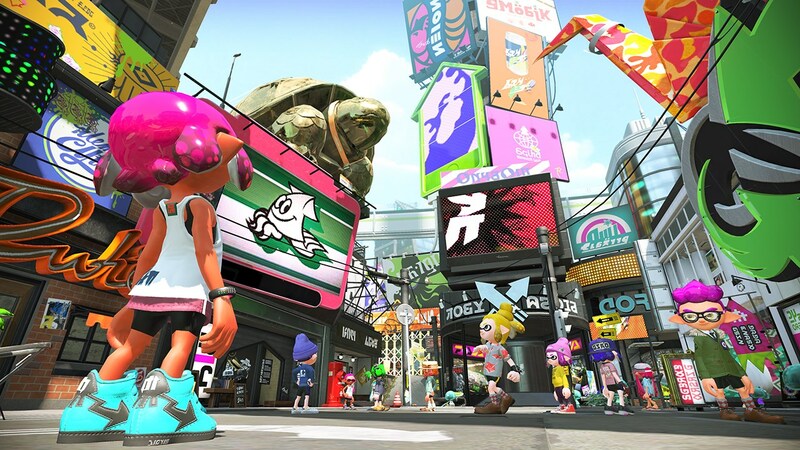 Overall, though, regardless of having totally new levels, sights, and bosses to partake in, Splatoon 2's campaign doesn't wholly feel like an astonishingly fresh foot forward. One of five bosses within Splatoon 2's solo campaign. This one packs quite a wallop! Speaking of the multiplayer modes of Splatoon 2 that I already went through, there's one more to talk about, but this one isn't competitive at all. It's Salmon Run, and it pits up to four players against wave after wave of Octoling forces, some lackey foes and some really dangerous bosses. The latter drop gold eggs when defeated, requiring players to take them back to a storage unit to satisfy the quota required to move on to the next wave. Between each wave, players switch between four randomly assigned weapons, keeping everyone from getting too comfortable. Splatted teammates can be revived by blasting them with ink, but it's all to easy to be overrun with enemies in the process so observant and alert players are required here. It's like playing many games on the Wii U that used both the TV and GamePad screens; it's hard to focus on both at the same time. During the hours in which you can actually play Salmon Run, the mode is a blast. While Salmon Run is a fantastic new mode, it suffers from an annoying setback: it can only be played during certain hours of the day. That's fine for everyone without a schedule, but that's not the majority of people in the world, Nintendo. Why not just have this mode open for everyone at any time of the day, or do you think you know what we want and how our busy our lives are better than we do? The annoyances with Splatoon 2 don't end there, unfortunately. Nintendo's online app for voice chat is the most asinine, insultingly stupid thing to come from Nintendo in a long lineup for idiotic "solutions" to problems. Somehow Nintendo's online system regressed from the Wii U. How do you even do that without purposefully, intentionally, maliciously doing so? Voice chat is limited to friends, if you can even play with them, as rooms usually fill up before you can join a friend. "Hope you don't mind waiting 3+ minutes to have a chance again to play a match with me!" It's all these systematic and quite frankly, obnoxious design decisions from Nintendo that turned me a bit off of otherwise enjoying my Splatoon 2 experience. Whether inking or splatting, Splatoon 2 offers a healthy and heaping dose of sloppy and satisfying fun. It has a sizable amount of content, including something I didn't yet even mention like being able to customize your Inkling in clothing and gear that affects not just your style but bonuses to him or her. Some of these include being able to move quicker through enemy ink, have better defense against bombs, swim faster through ink, and fast jumping to a teammate. However, with all the praise and admiration I give to the game, Splatoon 2 is far from excellent, whether it's the poor online functionality that severely prohibited my enjoyment of the multiplayer to the inane limited hours of Salmon Run. While Splatoon 2 is a game I wanted to love, all of its current boneheaded design decisions make it a game that I can only like. However, better to swim steadily with some faults than to flounder and sink altogether, right?